The following post and video above were shared with the CopBlock Network by a reader named Taniqua, via the CopBlock.org Submissions Page. It details an incident involving a school police officer with the Sherman Police Department (SPD) and his use of excessive force while breaking up a fight between two female high school students at Sherman High School (SHS) in Texas. The Sherman Herald Democrat published an article in the Sherman newspaper on January 23, 2016 about an SHS teen fight that took place on January 14, 2016. 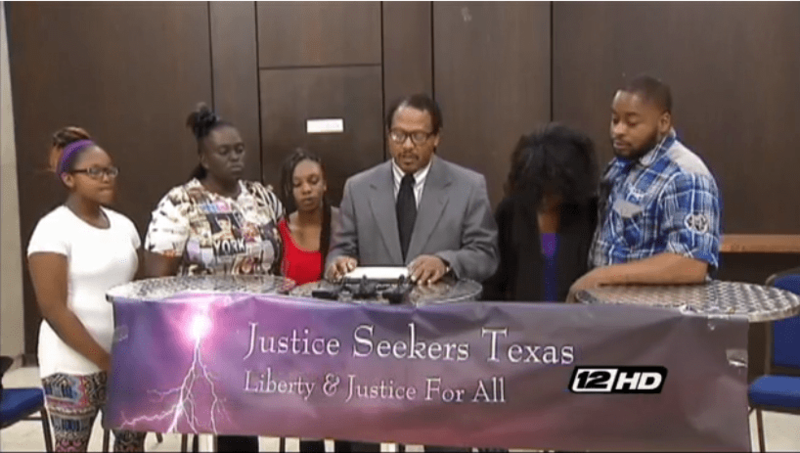 This report was in response to a press conference held by an activist group called Justice Seekers in support of Shatayvian Nelson and her family. However, some of the information that the school and the Sherman Police Department gave the news reporter appears to be false. At this time, the family would like to clarify some of the misinformation the Sherman Police Department is feeding the public. First, we would like to address the headlines. In the press conference video what you do hear Rev. Wright say is that “the family is asking that not only this officer is disciplined, but fired and that the school is also held accountable.” Fifty-eight seconds into the audio. Next, paragraph five of the article states, “the video shows Nelson appearing to hit her head on the tile floor.” Everyone that saw the video knows that was not an “appearance.” It clearly shows her falling back hitting the floor with such force it made a sound. Now, the crazy part about this statement is the fact that if the police department gets a video of someone stealing, they quickly claim the person is guilty, but when they get a video of one of “their” officers in the midst of a crime, they claim it’s an appearance. Hmmmmm, what’s wrong with this picture? In paragraph six and seven, Sherman Independent School District officials said they would not comment on the specifics of the incident, but goes on to say “they place the highest priority on the safety of students and staff.” Evidence reveals that this statement simply can’t be true. A video has surfaced that shows the bully in the school cafeteria badgering another young lady while Tayvi sat quietly behind her. The bully became so agitated because the young lady would not show any signs of wanting to fight her, that the bully aggressively threw her back pack on the floor and other kids in the background yelling. When watching the video you see no staff of any kind attempting to intervene. What this video shows is the students were either unsupervised for quite a few minutes or that staff were ignoring the teenagers’ actions. If this is what the school is calling a high priority on the safety of students by failing to supervise, it leaves all kids at risk of being bullied, stalked, or even threatened by anyone. So, parents should be concerned about their kids safety at the school. Please turn your attention to paragraph 11 that states “SPD is still investigating the incident and Assistant Chief Stephen Dean said it is taking an objective view at Garbacik’s use of force, which he said they do in “every” use of force incident.” First, it’s puzzling that they still have to investigate after the video dominated the internet showing the officer assaulting the 15 year old young lady. What is there to investigate? Makes you think there are some laws for some people and not others. Another issue that concerns the family is the statement the SPD makes is “Wright or any member of the family has not contacted SPD in any way.” On January 14, 2016, a witness, whose name will not be revealed for fear of being retaliated against, said that, after speaking with the doctor about the 15 year old’s condition, they physically went down to the Sherman Police Department to report the incident. The officer who they spoke with was Sgt. Tony. All details were given to him, including the 15 year old’s diagnosis that she suffered a severe concussion. To claim no one has informed them of her condition is an outright lie. Then to allow the child abuser to continue his daily duties is a danger to the society including kids! Furthermore, the police claim their job is to separate facts from fiction, but the SPD totally ignored the fact that they were told by a family member and a witness about the incident after she had been evaluated by the doctor the same day it happened. It seems the police are relying on third party hearsay to make their conclusions and not facts, like they are claiming. Talk about feeding the public misinformation. Now, if both parties are investigating, meaning the school and SPD, then they once again should have had the video that showed the officer’s misconduct. The school has also been given a copy of the medical records. It’s like they are totally ignoring all facts of evidence that both the school and the SPD have been provided on multiple occasions and then misinforming the public about the facts to get the public to agree that it’s OK to use excessive force on anyone, including kids. The public should be aware that other parents have come forward and have said that they have had the officer slam their kids around to. It seems SPD is beginning to show a pattern of using brute force against anyone. How is this type of misconduct acceptable? If the SPD is training officers to injure the public, then maybe their training tactics should be changed to something safer and less drastic than intentionally harming folks. All the family can say to the public is “don’t believe everything you hear from the police or the schools.” If you have any questions just email us and we have no problem answering questions.